I’ve been meaning to write this post for a while, but never got around to it. Back in April, we drove to Washington D.C. for a weekend trip. As part of the drive, we decided to compare Waze to Google Maps, and while I found Google Maps UI much nicer, the extra features of Waze were pretty neat. 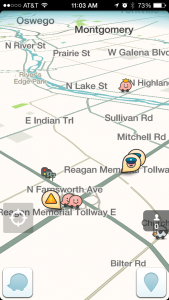 Waze is a mapping based application for your phone that integrates a crowdsourcing and gamification piece to reporting police, bad traffic, construction, etc. Unsurprisingly, Google has actually purchased Waze and has started integrating the data generated from it, but the Waze application still exists on its own and has a rather large following. Outside of the fact that having Waze open and plugged into an outlet during the drive actually lowered my battery a bit (there must be some serious crunching of data going on), I found it more effective than Google Maps on some of the crowd sourced features like monitoring for bad traffic and faster course correction to get around those types of issues. I’m not entirely sure whether the concept of crowd sourcing traffic issues is completely safe, as I have a hard time believing everyone using the app is using it responsibly (e.g. either a passenger in the car or their car is stopped), but it is tough to judge. However, one item in particular stuck out to me as I was participating from the passenger seat: the ability to note cars on the side of the road. While the accuracy of this was hit or miss (presumably some cars stop and then get going again), it made me think that tow trucks could leverage Waze to simply get notified when a car was on the side of the road and swoop in for a pickup. Admittedly I have no knowledge of how the tow truck game works on the highway (though this is surprisingly my second post about towing in the last 6 months), but the concept of leveraging data available to the public is going to have some interesting implications in the future.